Hi everyone! How are you great people doing on this Easter Sunday? I hope we’ll, happy and blessed. As, I was listening to the sermon in church, I began to think about the power of prayer and how praying affects me. I also think about how much my family and friends pray for me constantly. It’s been because of their prayers and support, that I’m able to keep a smile on my face during the challenges that life presents in my path. I know that things will get better because of God’s grace. So that led me to this question/quote. 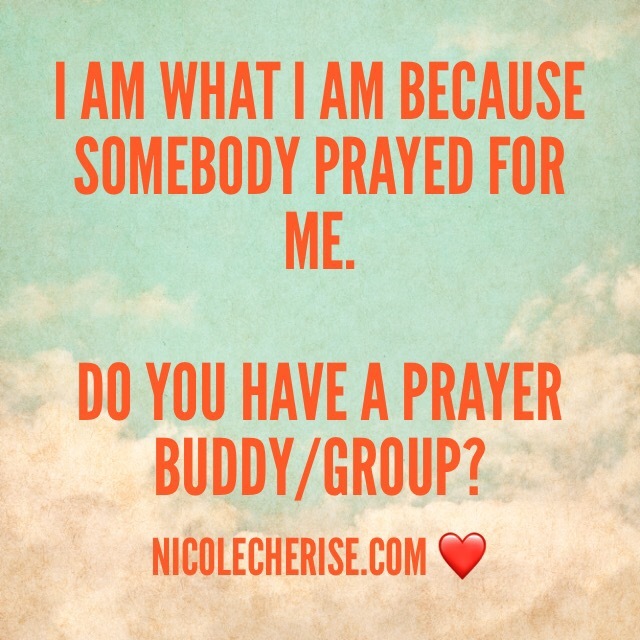 Do you have a prayer buddy or group? If not, I think it’s a good idea to consider. We have significant others, family, friends, church members, gym partners, and more who could meet with you to pray. With the age of technology, you can text, email, FaceTime, Snapchat each other if you can’t physically meet. There is no right or wrong way to pray, but you would be surprised of the many outcomes.